If the TDD formation is approved by property owners the Phase 1 improvements would begin in early 2017 and are projected to take 2 – 5 years to complete. Phase 2 improvements are dependent on the success of the Phase 1 improvements and could be constructed over the next 3 – 8 years. History: Since the mid-1990's the City of Rolla and MoDOT have been studying a variety of major transportation improvements to the area’s primary transportation system – Hwy 63/Bishop Ave, Hwy 72, Kingshighway (Bus Hwy 72) and Interstate 44. In 2002 MoDOT completed their Environmental Impact Statement which evaluated a number of alternatives to a "Rolla by-pass." The Rolla City Council gave a tentative endorsement of the EIS focusing primarily on upgrades to existing corridors with a new Hwy 72 extension to the west (to I-44) and ultimately a 5th (west) hwy interchange. Over the last 20 years the City and MoDOT has chipped away at several of the the EIS's core recommendations. Wanting to explore further development of 1,100 acres along I-44 to the west of Rolla the City sought a cost-share partnership with MoDOT in 2005 to fund the Hwy 72 extension (west to I-44) and engaged in a year-long planning process to consider how the 1,100 acre area west of the Kingshighway Interchange might develop – primarily as a mixed-use commercial corridor. Partnering with the University and the Hospital the Plan incorporated opportunities to develop the old S&T golf course to a "Tech Center" and areas to the north of I-44 at Hwy E as a sustainable, renewable energy campus satellite and early plans were underway for a new cancer institute at Phelps County Regional Medical Center. In 2007 the City Council adopted a broad master plan for the areas long-term development. With the Recession occurring in 2008 – 2010 most development plans were set-aside for better days. In early 2014 the City was approached by UTW, a St. Louis-based development company, interested in a partnership to create a major shopping district north of the Kingshighway interchange. In 2016 the County's TIF Commission unanimously recommended the Redevelopment Plan and in September 2016 the Rolla City Council and Phelps County Commission approved the Redevelopment Agreement. For Additional information please contact Mayor Louis J Magdits III or City Administrator John Butz at (573) 426-6948 or admin@rollacity.org. 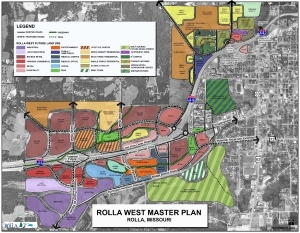 Included on the City’s website are the various studies and formal actions taken to examine Rolla West, to consider the Westside MarketPlace, and to understand the vision of the MoveRolla Transportation Plan. Nestled in the south central Ozarks Highland region, the City of Rolla is home to Missouri University of Science and Technology, Missouri's premier technological research university, and boasts a history that predates the Civil War. The appeal of Rolla and the region to visitors, though, lies in its recreational opportunities. Outdoor attractions abound with numerous springs, forested hills and rivers. Our parks system boasts over 304 acres including over 10 miles of walking trails, outdoor water park and state of the art indoor fitness complex. All these factors lead to an incredible quality of life as noted by Rolla consistently ranked among the most livable and desirable communities in the country by a number of publications. 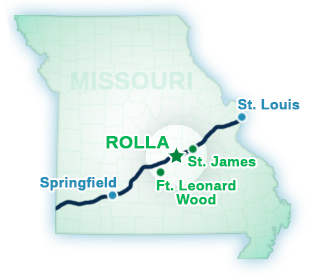 Located at the intersection of I-44 and State Highway 63, Rolla is centrally located within the state and less than 100 miles from St. Louis, Jefferson City, Columbia and Springfield. The beautiful scenery provides the backdrop but the City is blessed with an outstanding history and quality of life. The City was an important site during the Civil War, because the southwest branch of the Pacific Railroad ended here and the opening of Route 66 in Missouri was celebrated in Rolla. This is a community that values and promotes the arts, which explains the number of concerts, lectures, and exhibitions held annually. From the Blue Ribbon Schools to a regional medical center to a diverse economy, it's no wonder Rolla has been called one of the "101 Best Outdoor" towns or one of "America's Dreamtown."